The central components in compositions by loscil are the porous samples and grainy beats associated with Glitch Music. 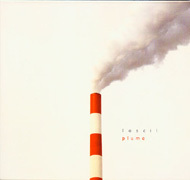 On Plume (62'39") these systems are artfully combined using computer-based digital production software and rendered into a unique sonic pointillism. Adding variation to loscil's loop-based work is the inclusion of real-time instruments alongside layers of computer generated pulse. By adding vibes, Ebow guitar and Rhodes piano to his pieces, loscil augments his mechanically intricate rhythmic cycles with an interesting spontaneity. Interleaving patterns comprised of odd clicks and bumps each spin at different ratios synchronized to a master clock. The virtual wheels and gears of loscil's motif engine crank out a heady-gentle machine music. Plume is the by-product of this reiterative process, which emblematizes eternity as a circle, and draws from while it adds to the endless coil of existence.